I tried this recipe on a whim. I wanted something simple to make using the ingredients that I already had on hand. Of course, I went to my bestie Pinterest and found this recipe and tailored it to my liking. I am not the biggest fan of lemon on my seafood. However, this recipe defiantly changed my mind about that. I had the salmon slightly cooled and squeezed some fresh lemon on it. Yes, Please!! It was simply divine. This recipe is defiantly going on rotation. I also think this salmon would be perfect on a salad. Thank me later! Preheat oven to 375°F Line a baking sheet with foil, large enough to make into a packet. In a small saucepan, melt the butter over low-medium heat. Add the garlic, honey, and lemon, and whisk until the mixture is well combined. Place the salmon onto lined baking sheet. Sprinkle salt and cracked pepper. Bake for 15-18 minutes, depending on your preference of doneness). Broil for 2-3 minutes on high/medium heat to caramelize the top. Garnish with parsley and serve immediately with lemon slices. We eat salmon her atleast a few times a month so maybe we can try a new recipe! The pictures make this meal look so delicious. I don't like seafood but I would try this because I love garlic. My kids and husband would probably like this! I'm not too big into salmon but my husband loves seafood! I should make this for him some time. I think he'd love it! I am big fish person (: So this recipe was definitely needed. I can smell the salmon through your post lol. I am going to give this a try! The title alone had my mouth watering. Your beautiful images sent me over the edge. I have to run out now to grab the ingredients. Mm looks good. I love lemon and honey! This sounds really good. I love salmon and honey so this meal is my kind of meal. I love honey garlic salmon! It's one of my go-to recipes. Your recipe looks delicious! Now THIS looks good. 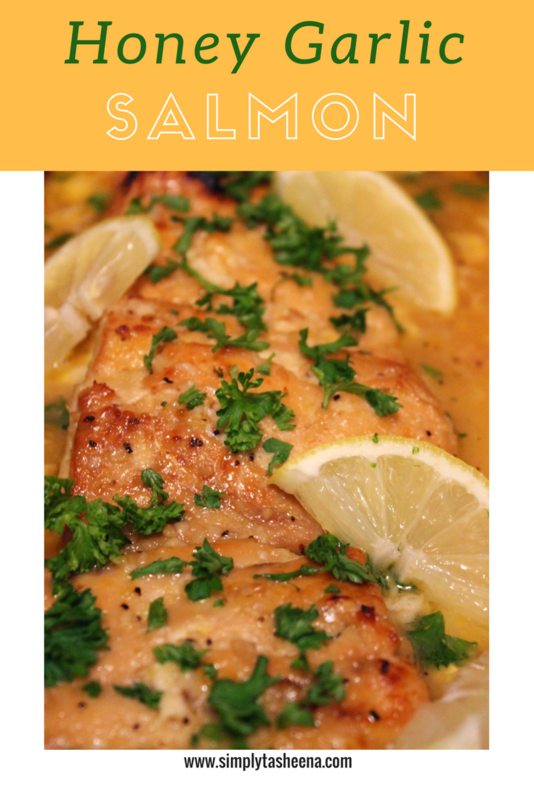 Salmon is one of our faves around here but we haven't made it like this yet. I gotta give this recipe a try. I love Salmon almost every way. This looks delicious. My stubborn hubby won't eat it so I am going to put it on my list to make when I have it with my stepmom for lunch every couple of weeks. We love it. Omg so yummy and I love salmon. Def trying this!!! I love salmon. I'm always looking for new salmon recipes. I will have to try this one.